As a seven-month child, Kepler was sickly from birth, and contracted smallpox when very young. His vision was severely defective, and he had various other illnesses fairly constantly, some of which may have been hypochondria. He took twice as long as normal children to get through elementary latin. He did a little better when he got to the higher school at Maulbronn, a school which only half a century earlier was haunted by the ill-famed Dr. Faustus (ref 2). Kepler went to the University of Tuebingen, a Protestant institution, where he studied mainly theology and philosophy, but also mathematics and astronomy. (The Dukes of Wuerttemberg, after becoming Lutheran, put in place an efficient educational system, with grants and scholarships for the poor, to ensure the universities could supply well educated clergymen capable of defending the new faith in the religious controversies raging at the time.) At the university, Kepler's exceptional intellectual abilities became apparent. He greatly admired the astronomy professor Maestlin, who publicly taught the Ptolemaic scheme, but privately believed Copernicus. Kepler himself defended Copernicus' scheme in a public debate. Unfortunately for him, that ensured that he would not be offered a faculty position at Tuebingen when he graduated. (Luther himself had mocked at Copernicus' scheme, and quoted scripture to prove it wrong.) Instead, Kepler was offered a professorship of astronomy in faraway Graz, Styria (now part of Austria), where he went in 1594. One of the duties of this professorship was to make astrological predictions. Despite his earlier efforts at horoscopes, he wrote "a mind accustomed to mathematical deduction, when confronted with the faulty foundations (of astrology) resists a long, long time, like an obstinate mule, until compelled by beating and curses to put its foot into that dirty puddle" (ref 1, page 245). Nevertheless, he predicted a cold winter, and an invasion by the Turks. Both predictions turned out to be correct. He was treated with a new respect, and his salary was increased. While lecturing to his math class in Graz, contemplating some geometric figure involving concentric circles and triangles on the blackboard, Kepler suddenly realized that figures of the type shown here determine a definite fixed ratio between the sizes of the two circles, provided the triangle has all sides equal, and a different ratio of sizes will occur for a square between the two circles, another for a regular pentagon, and so on. He thought this might be the key to the solar system. He truly believed in the Copernican system, so he saw the planetary orbits as six concentric circles. A natural question to ask is: why did the Creator make the orbits the particular sizes they are? He felt the universe would somehow show mathematical beauty or symmetry. Arguing in a way that Pythagoras and Plato would have sympathized with, he suggested that the orbits might be arranged so that regular polygons (triangles, squares, etc.) would just fit between adjacent ones, and maybe somehow this reflected some invisible underlying structure holding it all together. Disappointingly, he found it just didn't work out---the ratios were wrong. Then he had a real inspiration. The universe was really three-dimensional, and instead of thinking about circles, he should be thinking about spheres, with the planetary orbits being along the equators. 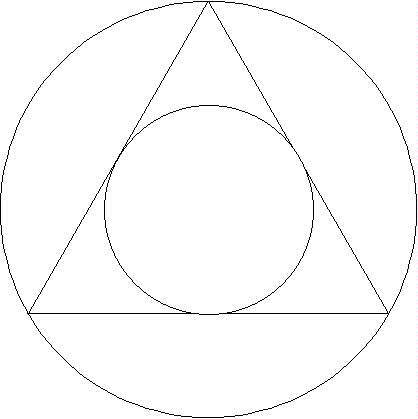 Thinking in three dimensions, the analogue of the above diagram would be two concentric spheres with a tetrahedron between them, so that the outer sphere passes through the vertices of the tetrahedron, and the inner sphere touches all its sides, but is completely contained in the tetrahedron. Now came the really exciting part-there were just six planets, so five spaces between spheres, and there are just five regular solids! Thus, if the distances came out right, the theory provided a complete explanation, in terms of an elegant geometric model, of why there are just six planets, and why they are spaced as we find them. Actually, the distances still don't come out right, especially for Jupiter, but Kepler was so sure of the rightness of his scheme, that he blamed the discrepancies on errors in Copernicus' tables. He modestly titles his work Mysterium Cosmographicum--the mystery of the universe (explained). The crucial illustration from his book is shown below, the outer sphere being the orbit of Saturn, and the central part is shown magnified at top right. Unfortunately Kepler (who described himself as a little lap dog) was barking up the wrong tree. We now understand that there are no compelling geometrical reasons why the planets are at just the distances they are from the sun. If the solar system were to be disturbed in some way, for example if another star were to come close, the planetary orbits would change. But it is unreasonable to think Kepler should have realized this. To him, the solar system was the central, most important part of creation, and one would expect the Creator to come up with something very special, reflecting the eternal truths of number and geometric form. In fact, Kepler's approach is quite appealing in the context of modern physics---the hydrogen atom has a single electron in orbit around a proton, like a one-planet solar system, and quantum mechanics only allows the electron to describe certain orbits, which are geometrically determined! 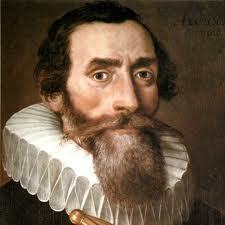 Kepler would have been a very good quantum physicist if he had been born three centuries later. "If we substitute for the word "soul" the word "force" then we get just the principle which underlies my physics of the skies...For once I firmly believed that the motive force of a planet was a soul...Yet as I reflected that this cause of motion diminishes in proportion to distance, just as the light of the sun diminishes in proportion to distance from the sun, I came to the conclusion that this force must be something substantial-"substantial" not in the literal sense but...in the same manner as we say that light is something substantial, meaning by this an unsubstantial entity emanating from a substantial body." In 1598, Kepler's school in Graz, along with other Lutheran institutions, was closed down by the young Archduke Ferdinand of Hapsburg, who had decided to cleanse the Austrian provinces of the Lutheran heresy. Kepler was allowed to stay for a while, but the next year he was given the choice of embracing Catholicism or being expelled from Austria. He wanted to go back to Protestant Tuebingen, but they didn't want him, because of his known belief in Copernicanism. Tycho invited him to come work with him, so he left for Prague on January 1, 1600. When he began working with Tycho's group, Kepler realized it would not be so easy to use Tycho's masses of data. Tycho was very secretive: he had his own agenda, which was to establish his own model of the solar system, an intermediate one, in which the sun goes around the earth once a year, and all the other planets go around the sun. He was not anxious for his data to be used to support a Copernican model. However, Kepler was happy that Tycho suggested he work on the orbit of Mars, which was one of the least circular orbits, and hence a good test of new models, and for which Tycho would be obliged to give him a substantial amount of data. Kepler made a bet that he would understand the orbit in eight days, actually, it took him eight years.